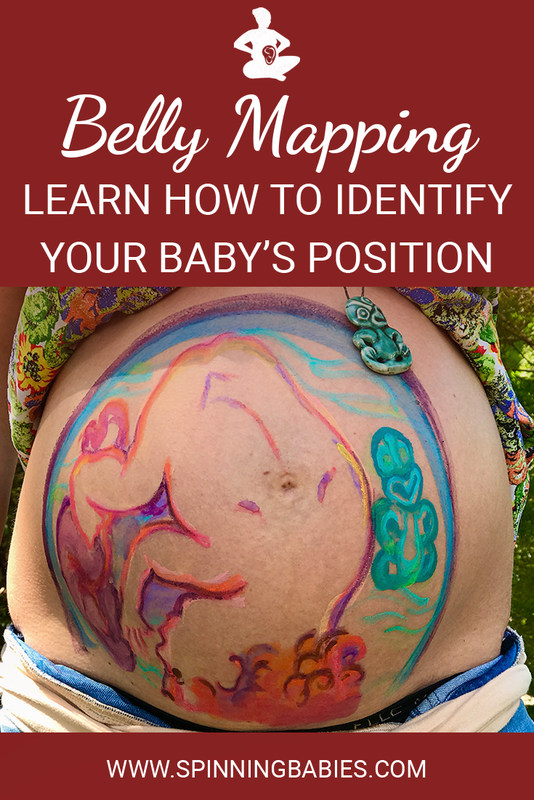 Learn how to identify your baby’s position with Belly Mapping. Fetal position MATTERS for pregnancy comfort and ease in labor & birth. “Belly Mapping: Using kicks and wiggles to predict posterior labor” appeared in Vol. 12. Issue 4 (Fall 2004) International Doula, a quarterly publication of DONA International (previously Doulas of North America) was the first published material on Belly Mapping. Belly Mapping(SM) is a three-step process for identifying baby’s position in the final months of pregnancy. Parents can use Belly Mapping for their own enjoyment. Medical caregivers can enhance their skills by using the visual clues of Belly Mapping. Doulas will be able to suggest strategies for fetal repositioning when a posterior lie is suspected. The point of Belly Mapping is the parent’s ability to identify baby parts and gain a sense of baby’s position. Most women, in the ninth month, can tell without ultrasound if their head down baby is facing the right, left, front or back. A few women, though, will find it hard to use Belly Mapping alone. Firm tone, abundant amniotic fluid, a placenta on the anterior wall, or a well-padded tummy can mute the kicks and bumps from which to map baby parts. Mothers often know more about their baby’s position than they first think. If a woman hasn’t already, encourage her to take a day or two to learn her baby’s habits. She will notice more details of baby’s movements when she is semi-sitting and breathing deeply and slowly. 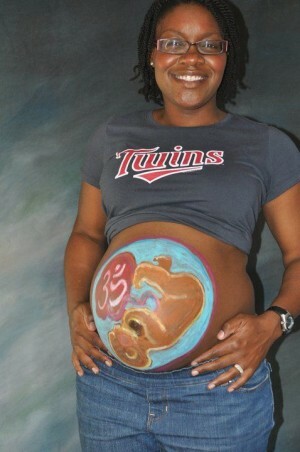 The three “Anteriors,” LOT, LOA and OA are all ideal for the start of labor. Both LOA and OA require less rotation than LOT and may start a faster labor, but may be less common than LOT. Generally, few midwives or doctors pay strict attention to the actual head position so the LOT baby is very often called LOA or just OA. Four starting positions often lead to (or remain as) direct OP in active labor. Right Occiput Transverse (ROT), Right Occiput Posterior (ROP) and Left Occiput Posterior (LOP) join direct OP in adding labor time. The LOP baby has less distance to go to get into an LOT position. The incidence of posterior babies at the start of labor is scantly studied, and existing studies almost universally ignore all but direct posterior babies. As labor begins, the high riding, unengaged Right Occiput Transverse baby slowly rotates to ROA working past the sacral promontory at the base of the spine and then swings around to LOT to engage in the pelvis. Most babies go on to OA at the pelvic floor, or further down, on the perineal floor. If a baby engages as a ROT he or she will commonly go to OP, but a few to ROA in midpelvis, and continue down to finish as either an ROA or OA. Both hands in front indicate a posterior fetal position. This baby is Left Occiput Posterior. Childbirth texts estimate 15-30% of babies are OP in labor. Jean Sutton in Optimal Foetal Positioning describes that 50% of babies tend toward posterior in early labor upon admission to the hospital. Strong latent labor swings about a third of these to LOT before dilation begins (in “pre-labor” or “false labor”). The Belly Mapping Workbook is full of details, like this, for accuracy and what to do about fetal positions. Jean Sutton’s observation indicates that some of the babies starting in a posterior position rotate before arriving to the hospital. Ellice Lieberman observed most posteriors will rotate out of posterior into either anterior or facing a hip throughout labor. Only 5-8% of all babies emerge directly OP (13% with an epidural in Liebermann’s study). At least 12% of all cesareans are for OP babies that get stuck due to the larger diameter of the OP head in comparison to the OA head. It’s more common for ROT, ROP and OP babies to rotate during labor and emerge facing back (OA). Some babies get stuck half way through a long-arc rotation and some of them will need a cesarean anyway. Due to the physical therapy background of DONA co-founder, Penny Simkin, our DONA birth doula trainings and annual conferences include helpful techniques for babies whose heads are less than ideally aligned in the pelvis. The Labor Progress Handbook gives caregivers non-surgical strategies with movement and gravity. 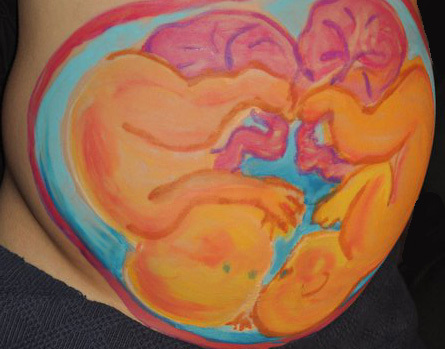 Belly MappingSM is a pleasant, bonding experience for a family. Fears about posterior fetal positioning should be reduced with a calm and confident response about a variety of solutions a mother can choose from. 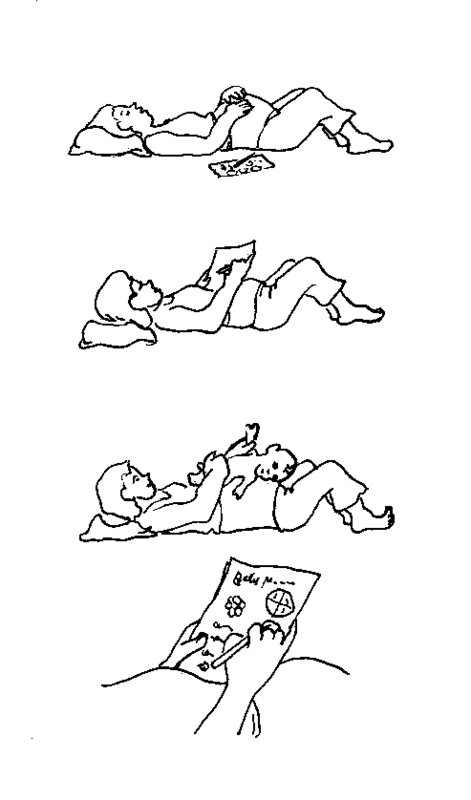 Simple demonstrations of some of the techniques taught in doula trainings, such as the Abdominal Lift, and the Lunge will reassure parents that rotational support is available. 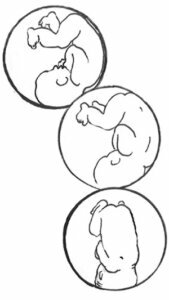 The “Three Anteriors” babies have the easiest time, now, rotating to the final birth position of Occiput Anterior. When baby is descending well in a posterior labor, it is usually ok. The exception happens with a labor in a woman with a smaller, usually triangular or “android” pelvis shape. If the presenting angle of the fetal head makes the head seem too larger for her body, a quickly progressing labor will bring a surprise ending. After a pretty normal seeming first part of labor, there gets to be a long time with no more fetal descent. The baby is often born with cesarean surgery. If the posterior baby can back up and try again, there is hope for a vaginal birth. To help the baby do this, an inversion of some type is necessary. 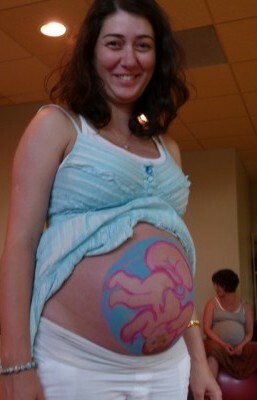 Check out this great video below of Belly Mapping and painting fun at the Twin Cities Birth and Baby Expo 2012. This video montage was lovingly created by Brook Walsh. Daily Essentials: Activities for Pregnancy Comfort & Easier Birth – Download it today for comfort tonight! For avoiding long labors, back labors, or cesareans in labor, take the Parent Class with you on your device. Simkin, Penny and Ancheta, Ruth (2000) The Labor Progress Handbook Blackwell Sciences (See the expanded new edition published in 2005).